This is one of my favorite waterfalls mostly because I can visit often. Sometimes I stop by on my lunch break. 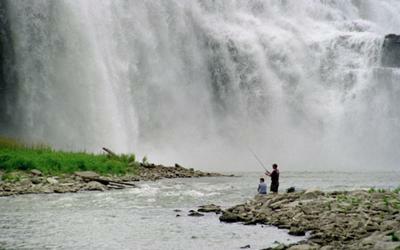 When the river is running high, there is considerable spray from the falls. In the winter this produces a localized ice storm. When there is sunshine, there are vivid rainbows. When the river is running low it is safe to climb down to the crest of the falls and walk out on the low dam at the crest of the falls. While the falls are in a urban setting, it is far more park like now than 125 years ago. When Rochester was known as the Flour City (rather than the Flower City), the river was lined on both sides with mills. The gorge below the falls is wild and wooded. It is easy to forget you are in the middle of a metro area with about a million people (except in the fall when the salmon are running).